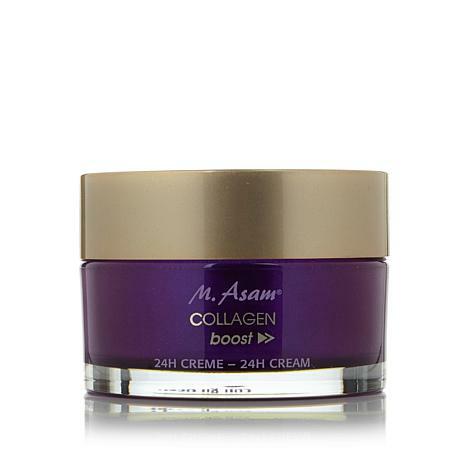 M. Asam Collagen Boost 24H Cream 3.38 fl. oz. Pamper yourself around the clock. 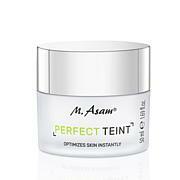 Filled with indulgent ingredients, this facial cream delights the senses with a pleasant floral fragrance. 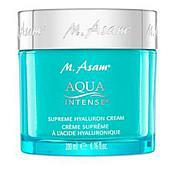 Allow its gentle, silky-soft formula leave your skin feeling supple both day and night. Collageneer® is a registered trademark of Laboratoires Expanscience. Ingredients: Aqua (Water), C10-18 Triglycerides, Glycerin, Pentylene Glycol, Acacia Decurrens/Jojoba/Sunflower Seed Wax/Polyglyceryl-3 Esters, Polyglyceryl-6 Distearate, Coco-Caprylate, Microcrystalline Cellulose, Cetyl Alcohol, Helianthus Annuus (Sunflower) Seed Oil, Sodium Stearoyl Glutamate, Simmondsia Chinensis (Jojoba) Seed Oil, Macadamia Ternifolia Seed Oil, Lupinus Albus Seed Extract, Lecithin, Soy Isoflavones, Tocopherol, Parfum (Fragrance), Cellulose Gum, Alcohol, Disodium EDTA, Ethylhexylglycerin, Xanthan Gum, Dimethicone, Phenoxyethanol. I try to write reviews when I can because I usually reads other reviews on products and it really has helped, so here goes. I love his body creams, but this face cream is heavy and pills on my face. This is a pain if you try putting on makeup.